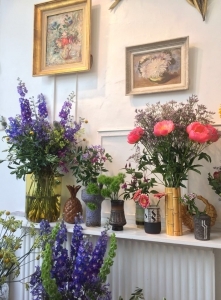 the flower factory LDN (formerly Flor Unikon Flowers) is a boutique floral studio located in the heart of Clerkenwell, Hatton Garden and Farringdon. 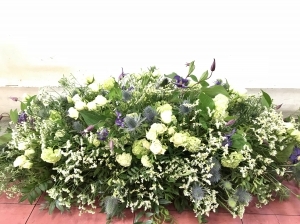 We create seasonal, natural, bespoke arrangements with a Skandinavian twist using the freshest flowers and foliage. Great service, fantastic product and swift delivery. Super helpful team, and the flowers were beautiful. Khin was so attentive, really interpreted the brief, nothing seemed like too much, includinga very early start indeed. So thank you for being so responsive and great to work with. I didn't see the products. Beautiful arrangement. The handwritten note card is a nice touch. Many place simply include a computer printed note. Not great, but they were pretty on delivery. My daughter thought the flowers were beautiful and loved the colours! Brilliant as ever! Thank you! Always a fabulous caring and reliable team to work with. Thank you from Down Under ???? The flowers were beautiful. The florist was very good with communication and assisting me with specific requests. Excellent selection of flowers. My friend who I sent them to thought they were wonderful. As did her work collegues. Beautiful bouquet and great service. I would recommend them. I thought from the photo there would be red roses for the anniversary, but the bouquet was beautiful and very much the style of Flor, which I am familiar with, and my wife loved it. Beautiful flowers and very responsive service. I would use again and recommend. arrived on time, sounded like they were nice! Flowers were amazing, delivery was within a few hours of the order. Great selection of very high quality flowers. Quick (same day) delivery and nice bouquet 'The Country Charm'. My girlfriend loved her flowers! Absolute 1st rate service. Delivery was immediate and florist called to let me know the item requested was not in stock but they made me up another bunch in place. Flowers were very disappointing. Ordered 'Contemporary bouquet' and instead got a standard looking bouquet with roses which I do not consider particularly contemporary. What's more, the roses were old, discoloured and tired looking. Deeply disappointing considering the order was near enough &pound;50 in total. Not a happy customer. Couldn't fault the delivery and flowers! I wasn't expecting the flowers to be lime green and include purple cabbages. But hey ho. I can't praise Paul from Flor Unikon highly enough. He persisted with a difficult delivery, coming back the next day to ensure that the flowers reached our friend in hospital. She was delighted with the bouquet and called it 'a breath of loveliness from the outside world'. The service provided by Flor Unikon and direct2florist was superb. I had originally booked the flowers to arrive in the AM but was able to change this to the PM at 8.30 in the morning of delivery day. This flexibility is really great. The flowers themselves were lovely and the recipient was very very happy. Was great! Delivered the flowers to my friend in time. Lovely quality flowers and presentation. Thank you! The flowers were lovely and delivered promptly! I didn't think the flowers matched the ones in the image in terms of attractiveness. The recipient was delighted with the flowers and she sent me a picture. They looked lovely! I ordered flowers for my mum's birthday online. She lives in London, I live in Bangkok. The flowers turned up for her on the morning of her birthday. She liked them. Boom! Potential disaster averted. Will probably get away with this for Christmas too. The flowers were incredible. So beautiful and tailored to my request. I ordered from Unikon because I was looking for something a bit more special than the typical bunch of flowers from a florist. What my friend received looked very ordinary and very different from the picture online (yes, I know that it was never going to be the same). I can't say I was very happy I'm afraid and the order cost nearly &pound;55!!! Recipient very happy with flowers. Nice to see something Wee bit different. The recipient was very pleased to receive the bouquet: thank you so much! It was important. I specially made my order through Flor Unikon as their work is exceptional and unique. They did not let me down! The recipients of their flowers were thrilled and overwhelmed with the flower arrangement. Mother in law was very happy with product. nit exactly the species of orchid as shown in the image but that's natural given the season etc, not a problem. Wonderful inventive florists. Lovely people. Absolutely 100% reliable. Highly recommended. I have used them many times. Everything was great and delivered on time. Flowers delivered on time and were beautiful. My Mum said they were lovely. The choices were lovely & varied, the prices very fair, & customer service was exemplary - truly outstanding (many thanks, Paul!). My niece was beyond thrilled - her words: The most huge and incredible explosion of purple pink lusciousness just arrived at my door!!!" and she went on from there. Highly & enthusiastically recommended. :-)"
Absolutely beautiful seasonal flowers. A perfect gift for my first wedding anniversary. Thanks to Flor-Unikon. My friend was over the moon!!! Gorgeous elegant flowers that definitely stood out from the crowd. Beautifully presented, good quality and a lovely scent. The flowers were for my mother and she loved them. I will use Flor Unikon again. Quick delivery, very helpful staff, and my girlfriend loved the flowers! Recommended! The flowers were similar to the photo in colour, and they were top quality. The result was a very happy recipient. Gorgeous flowers. Prompt delivery. No complaints. I ordered the flowers on a Thursday to be delivered on the Friday (our 5th anniversary), however we split up during the morning of Friday! 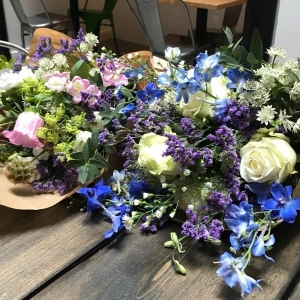 I received an extremely gracious thank you message (blah blah blah..) from her around lunchtime, which I TOTALLY wasn't expecting, so I am therefore assuming that Flor Unikon's flowers are absolutely amazing, I therefore recommend them to any loved-up fool!! Great florist. Flowers arrived in a timely manner and were perfect! Flowers were very pretty, and speedily delivered. Nice bouquet - delivered on time. 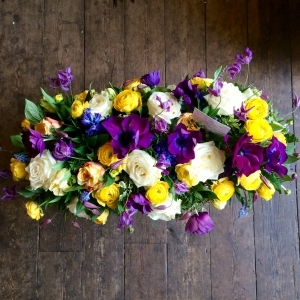 Very reassuring to get photo of actual flowers before delivery and confirmation when they had been delivered. I haven't seen the flowers that you sent but my friend to whom i sent them was very happy. 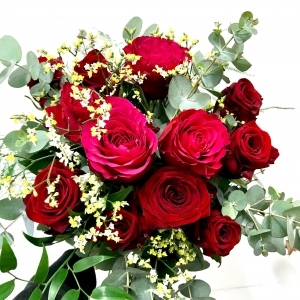 The service was excellent, and good value, especially in comparison with other online florists. Thank you. My brother was very happy to recive the flowers and it really mad him feel better, and the staff at the hospital also told he was very proud of this. I didn't see the flowers first hand, but my daughter said they were just beautiful. Many thanks. The flowers were beautiful but the arrangement was a bit odd. I paid £100 and 1/3 of the bouquet was an odd bush. Beautiful flowers, our friend thought they were wonderful! Beautiful flowers. My friend was delighted! 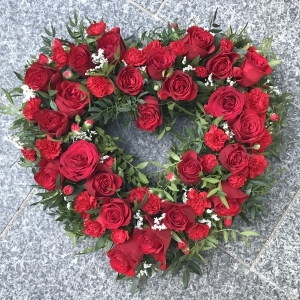 Excellent service, florist made effrort to deliver at the time specified, even rang the recipient to ensure they were home to take delivery. Recipient was extremly happy with the flowers, they were beautiful. Highly recommend this florist and will be using again in the future. Thanks! Girlfriend loved the flowers and delivered on time as promised. An amazingly service, with beautiful flowers. Many thanks for the lovely flowers my daughter received. Beautiful flowers, listened to my requests and delivered something lovely. Good reports from the recipient! Perfect. She loves the flower. The recipient says the flowers are just lovely - both to look at and smell! The service was excellent - the company had to make 2 attempts before the flowers were delivered and was both helpful and efficient. Altogether a really satisfactory transaction. Magnificent flowers, hand-delivered, a real pleasure. Fantastic! The flowers were beautiful, the service was great and the price was very reasonable. Very happy better half. Enough said. the recipent's comment was "a really beautiful and extremely stylish bouquet of flowers"
The flowers have always been just what I've ordered, and in some cases, were even more spectacular than I had thought. 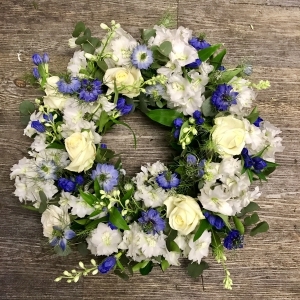 Great care with the selection of your various florists is obviously a key deliverable for your company and it certainly pays off. Quality flowers. On time. Spot on. Excellent efficient service. Ordered online for same day delivery in London and the bouquet arrived in a matter of hours from time of order. The recipient was over the moon with the "stunning flowers". Would definitely recommend this florist. Florist was fine and brilliant but the website never sent me a credit card receipt for the payment. That's not very good at all. Flowers delivered on time, in great condition. Were thoroughly enjoyed. The flowers were delivered a.m. as requested, and were a beautiful combination, much admired by the recipients. Excellent service. Perfect surprise and very beautiful. My friend loved the flowers. Very pleased with the service. Many thanks. Excellent service! My client was very happy with flowers. Definitely will be using again! Excellent, fast, and reliable service! Thank you! My girlfriend loved the flowers. She was unexpectedly away from her work on the original delivery date - but Flor Unikon delivered them again the next day at no extra charge. They were very friendly and helpful on the phone. Will definitely use them again. Used Flor Unikon for Valentine's Day. Only reason I'm submitting a rating is because the service was very, very good. Ordered on line and then spoke twice on the phone and everything went smoothly; they also delivered outside of working lunch hours which I requested. Flowers were excellent quality. Would use them again, very good. Excellent quality and timely delivery. What more do you want? lovely bunch of flowers, recipient was delighted. thanks! Flowers are superb, brought a ray of sunshine to my daughter's day. Fabulous service, delivered with aplomb! Thanks very much - will use you again, no doubt at all. Thank you so much! I ordered after midnight and the flowers were delivered the same afternoon. My daughter loved them! I will definitely use your service again for the next time my daughter is dancing at Sadlers Wells! Great service, I was a tad late with arranging my wifes birthday present so I ordered flowers. They arrived at her work within 2 hours of me ordering them and they looked fantastic. Arrived safely! Perfect. But nothing like the arrangement asked for! Transaction was easy, service was flawless, my daughter received her flowers exactly when I wanted them delivered. I was even on the phone to her when she had to answer the door and the products were fantastic - she loved them. She also mentioned the delivery man was very nice and wished her a Happy Birthday! 1st class on-line service. Thank You. Would absolutely recommend this service. Superb and timely service and most importantly, beautiful flowers. My girlfriend was impressed that the flowers were delivered by a lovely and dapper man. Flowers arrived promptly and I am told that they are beautiful! I will definitely use this service again. I sent flowers to my daughter for her birthday. She tells me their perfume fills her flat. I was very happy and would use this florist again. Wow! the delivery was made less than 4 hours later, beautiful and a wonderful treat for my friend. Thankyou so much for such excellent service. I understand that the flowers were beautiful and arrived at the time I requested,thankyou. Commendable service!! Highly appreciated, and will definitely drop in again. Quick delivery and quality flowers, I cannot complain especially as they managed same day delivery before lunchtime with no issues. Prompty delivery and i believe beautiful flowers. You saved my face;well done.I hope to use your services again. Nice flowers. Only downside is that the site never updated when the flowers were delivered, leaving me a little concerned. Delivery in time; nice flowers; thank you! 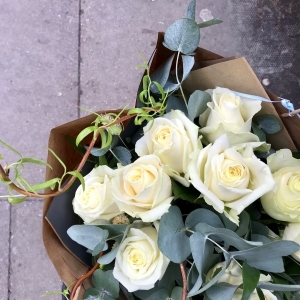 Was most impressed with the quick response to my emails querying the change of florist and then from the florist replying with a full explanation of the problem. The florist ensured that the flowers were delivered on the day even though they had difficulties. The service was much appreciated - a Huge Thank You. As usual a beautifull selection of flowers, the whole family now use this florist. timely delivery and flowers were raved over, said they were gorgeous and smelled wonderful. thanks! Quick delivery and according to recipient "absolutely beautiful"
Owner Buffy is very friendly! I've placed order flowers from thousand miles away. (Orange County, CA) Flor Unikon was very punctural with my request delivery time. Buffy(owner)has great experiece of making flower delivery to a highly secure. Got flowers delivered to the right person. (my honey). :-) My honey was very please with the friendly deliver service. Now, Flor Unikon is my only florist I would order flowers. I went with this florist as they said they could deliver on the monday 11th, however the flowers were not delivered to the following day. Delivery order well executed. Friendly delivery staff. So happy with Flor Unikon's service. Followed instructions to a tee, and delivered a lovely hand tied. Thanks so much for making this so easy for me to send flowers from the States. I will certainly use you again! great service, great flowers, full marks! No complaints. Flowers were delivered on the day requested. Extremely lovely and helpful people! The flowers were beautiful! 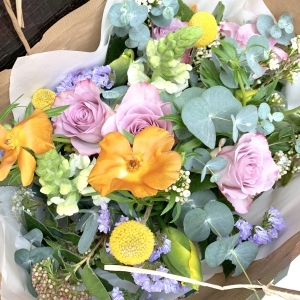 Flor Unikon is our favourite London florist. There was a delay in delivery, but overall the service was ok.
Fast, efficient service. Will definitely recommend and use again! 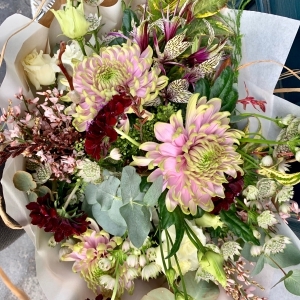 they have been great: lovely and original bouquet, super friendly service and they really made a great effort to deliver to the right address even if i gave them incomplete postcode. will definitely order again from them! Have just seen the flowers and they look fantastic. Great service. Very happy customer, beautiful and imaginative product. My Sister said the flowers were beautiful and the roses were huge. Thank you Flor Unikon they had the effect I wanted them to have. Well done! Good, prompt, polite service. Flowers are beautiful, delivered today mothers day, made mum's day special. will certainly use you again. timely delivery and beautiful arrangement. thanks so much. A selection seasonal flowers English garden style. 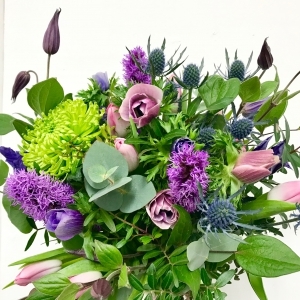 Book a seasonal floristry workshop and learn a new skill. 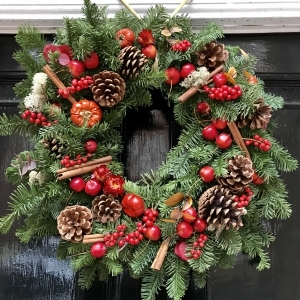 A stylish wreath with seasonal flowers in a loose, natural style. Available in a choice of colours - please add in notes. A fresh and seasonal display country garden style. A seasonal pine based wreath.